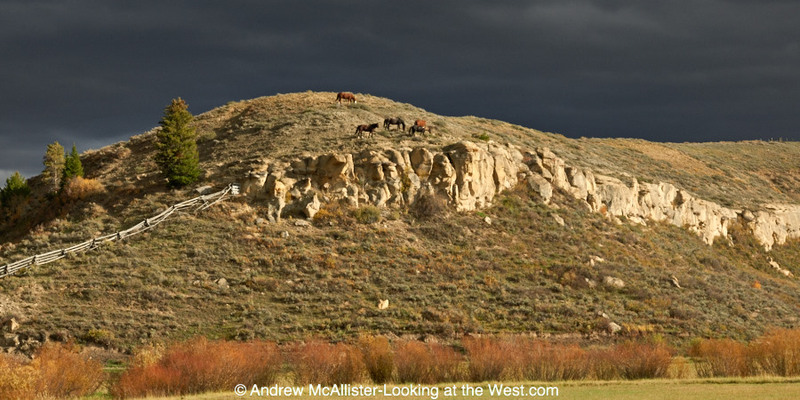 Working on the last post I remembered that I had another shot of a group of horses that I wanted to share on LATW. Taking the scenic route home from Jackson to Cache Valley via Diamondville last fall ended up taking many more hours than expected. 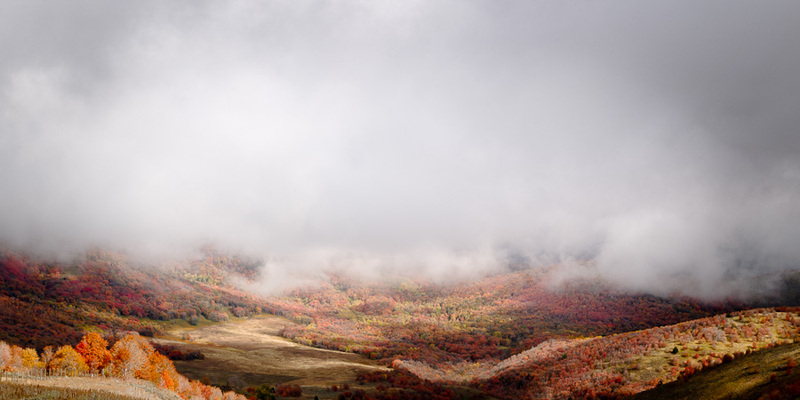 With a lot ground to cover, dramatic sky, fall color and a photographer driving it was anything but quick. After a few stops you just have to stop stopping or it will be midnight before you are home. 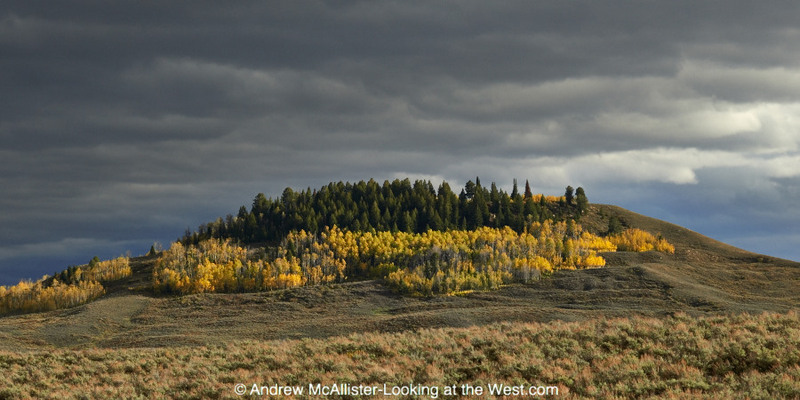 Fall color near Bondurant, Wyoming. The Flat Top, north of La Barge, Wyoming. I have a history with looking up in my photography that started a dozen or so years ago when my friend Jason Byers encouraged me to get closer and exaggerate the perspective of Cleveland skyscrapers. As a result my approach to large objects has always had two competing views. One that says step as far back as necessary to make absolutely sure the perspective is correct and the other that says get too close and look up. To get the perspective correct I use a tilt and shift lens when possible and correct perspective in photoshop for images taken with non PC lenses. For years I have been very comfortable with the way I see the world and what I want to photograph in it. Lately I have been experimenting with selective focus via tilting the lens as a way to creatively stretch they way I look at things. 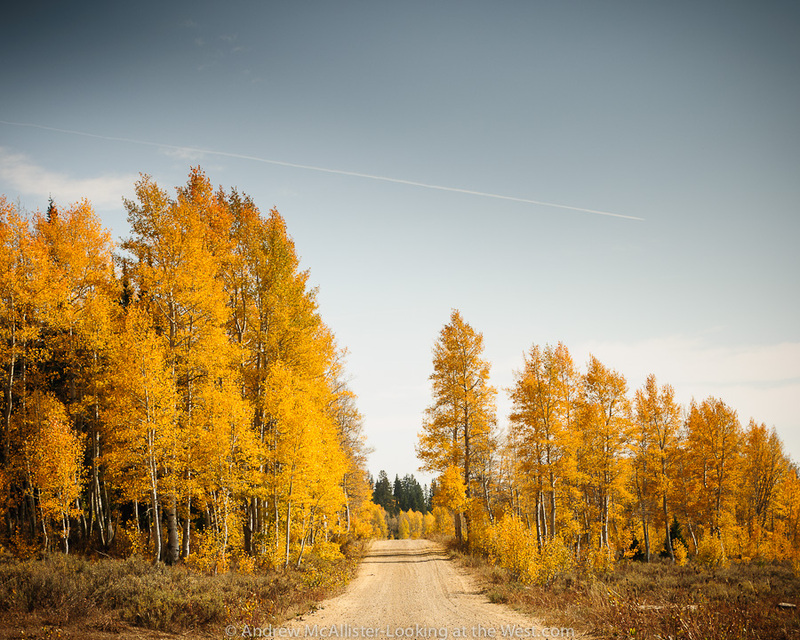 The images in this post a outside of my comfort zone photographically in two ways, one being that I don’t shoot fall color landscapes. They have not been of interest until I moved to Utah and I’m still not sure what I think beyond the color. The second thing that takes me out of my comfort zone is the play of focus. The lens tilt makes things look as if the are miniature and is best accomplished by looking down on the subject. However with the above shot I am clearly looking up. I enjoy the confusion that it causes. 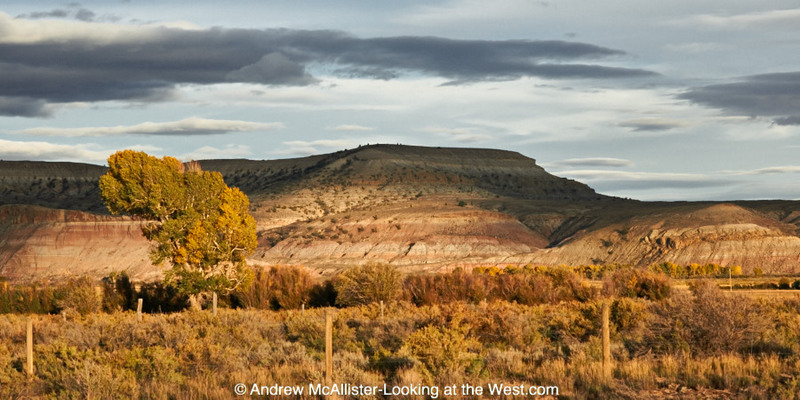 The western landscapes is huge and are always photographed to emphasize the size. However this stretch of mine is forcing these huge thing to appear way smaller than they are and thus subvert their western-ness. Below is a more traditional angle of view using the tilt effect. Most photographers are aware that these effects can be accomplished in newer versions of Photoshop and many iOS apps however I personally would recommend using the lens itself. There is something about committing to the focus area you are interested in and locking that in the RAW file that gives the stretch impact. The lenses are available to rent from Borrow Lenses dot com and Lens Rentals dot com. 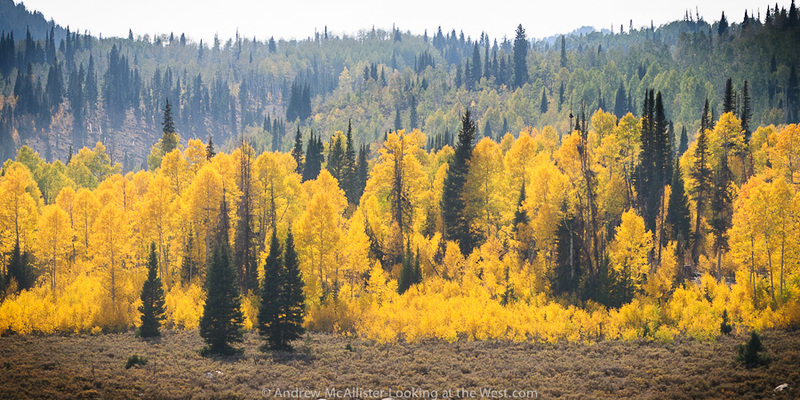 Grove of Aspen trees in Northern Utah. Until recently I did not know that a grove like this can be all one interconnected living thing. Pretty amazing. 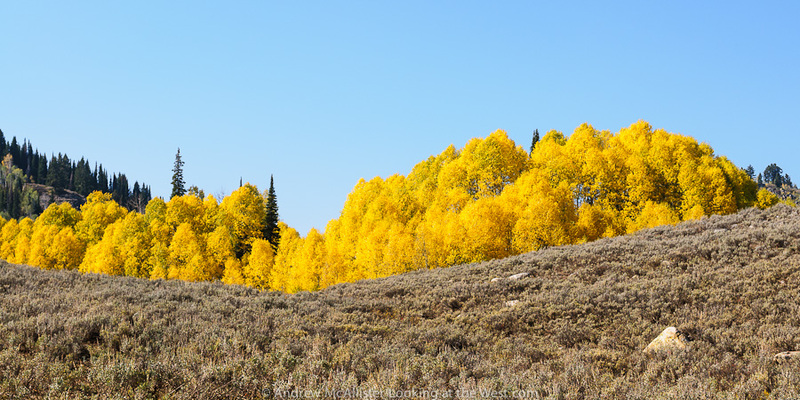 Below, another view of the same stand of Aspen. 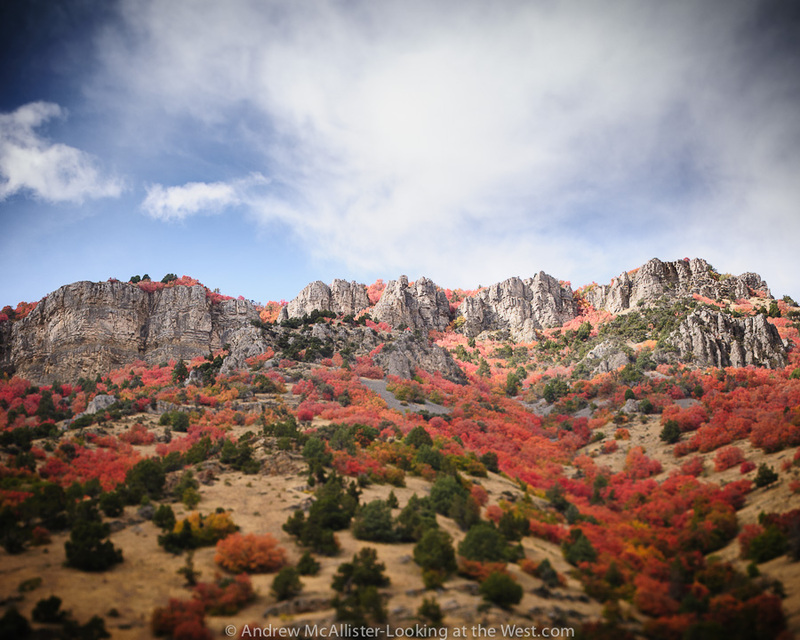 Fall color is in full swing here in Utah. Hope everyone is out enjoying it, I know I am. Last year I missed most of it due to travel so this is my first real Utah fall. It is amazing! 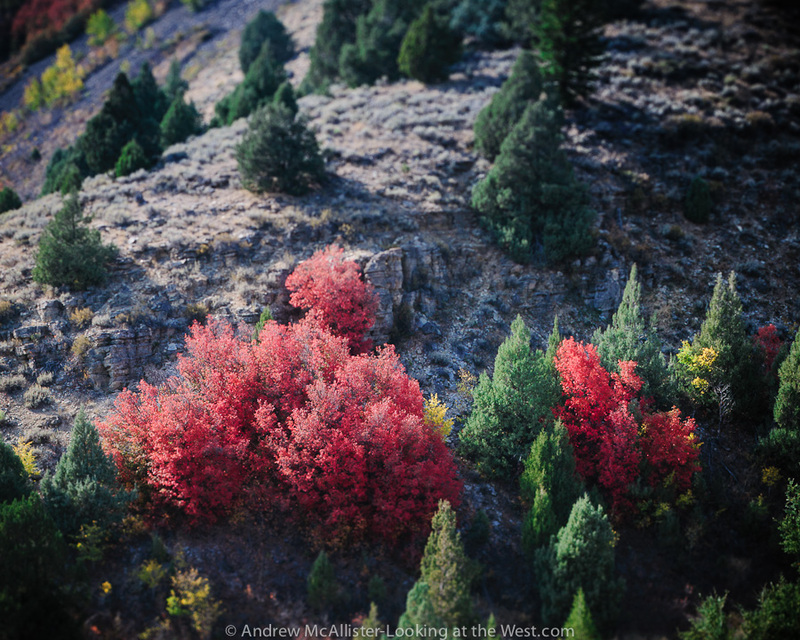 In the coming weeks I’ll be posting more fall color, images from the Tetons, another Moab trip and an entirely new series. Hope to get things caught up before it starts snowing. Have fun exploring your world! After months of sunshine finally Northern Utah had a few days of rain and clouds in the forecast. A storm coming up from the south decided to bring some cold temperatures and snow at higher elevations. 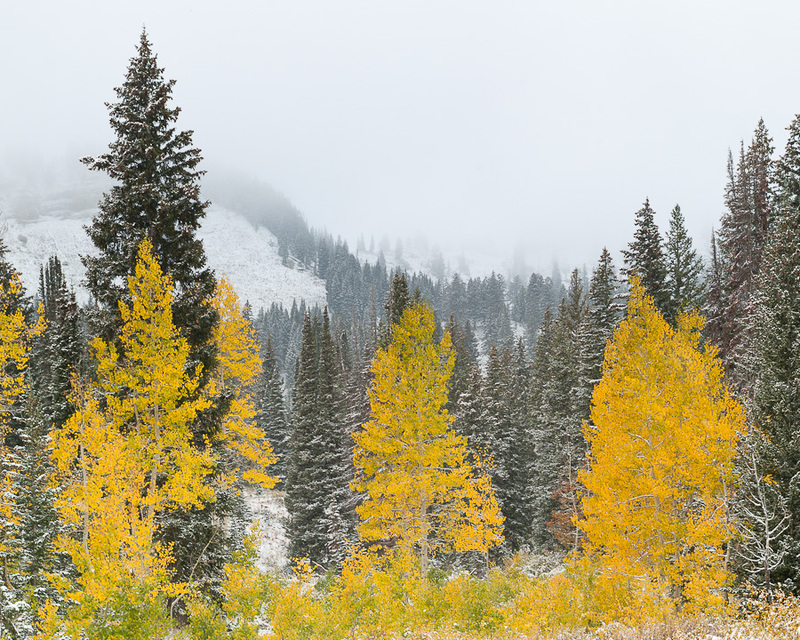 As it started late Wednesday I took a quick drive up Green Canyon (I’m based in Cache Valley) to see what was happening at the higher elevations with regard to weather and road conditions. The next afternoon as the cloud cover started to pull back a bit I could see that indeed elevations above 6000 had snow cover. 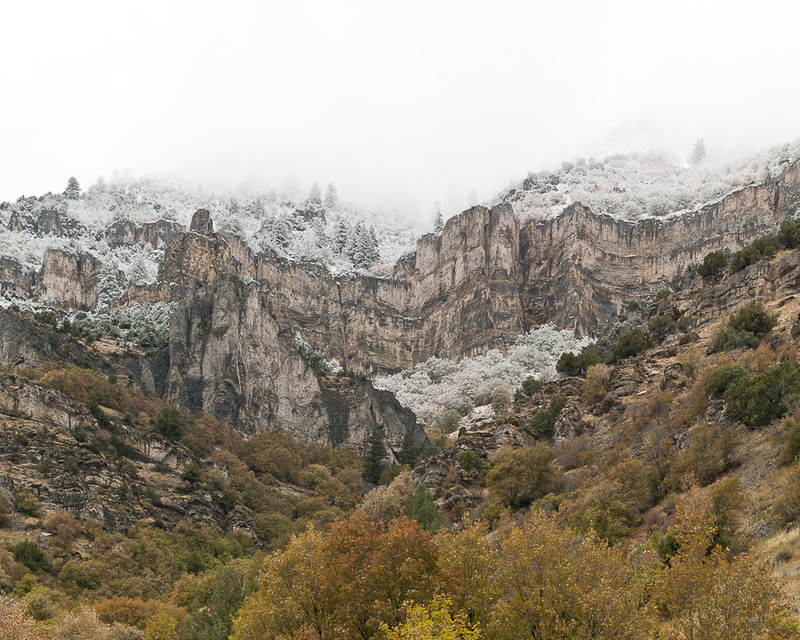 I decided to head out to Blacksmith Fork Canyon and see how the snow was mixing with the fall color and the cliff faces. I found a few good spots to photograph along the way toward Hardware Ranch. About half way there the clouds and cliff faces were looking good near the Left Hand Fork of Blacksmith Fork Canyon. I decided to check it out and maybe go as far as the old ranger station that I had photographed this past summer. Road conditions were generally ok for the weather. A little sloppy in areas but those spots were few and there were a few ranchers working in the area with much larger vehicles and trailers so I figured the roads were acceptable. Stoping for photographic opportunities and the occasional group of cattle in the road we made it to the old ranger station in good time. After a few shots I decided to go to up to the junction of Herd Hollow and see how that was. At this point the the roads were in good condition, compacted dirt and gravel mix with larger rocks here and there and not sticky at all. Now this area is listed on some maps as a 4×4 road and on a ShoShone Trail map from the Forest service it is listed as most difficult but not ATV only. I decided to give it a go, soon I came to a sign saying that the road was not suitable for passenger cars 6 miles ahead. Since the Nissan Xterra has higher clearance than a passenger car we kept going. Now this road passes two springs and runs along the base of Boulder Mtn. ending at the junction of trail 3 (Shoshone trail map) which is rated easiest. If we could make it to the junction and the steep hill out of the canyon was passable this could be a round trip to Hardware Ranch. But was not to be the case this time. A few miles up the road I came to a point where it looked like trouble could be ahead. I got out and walked the road for a bit and it appeared that no full size vehicle had bee through there in some time. The good part of the road had been used for ATV “cars” that have a sightly larger wheel base than an ATV but smaller than a truck. The trail had a steep bank on the left side that a truck could drive on without tipping and the right side had pretty thick cover of vegetation. Now this part was technically doable albeit with some major scratching on the right. The situation as I saw it was there was no way I was going to back out of this spot should the road be not passible up ahead as the sign at the trailhead had suggested. It was just me and my dog Mirabelle, and there was nothing she could do to help in a situation should one arise. Had I been traveling with another vehicle or at least another person experienced in off highway driving maybe I could do it. Oh yeah and it was starting to snow again. Time to back out of here and stay on a more defined and better maintained road. 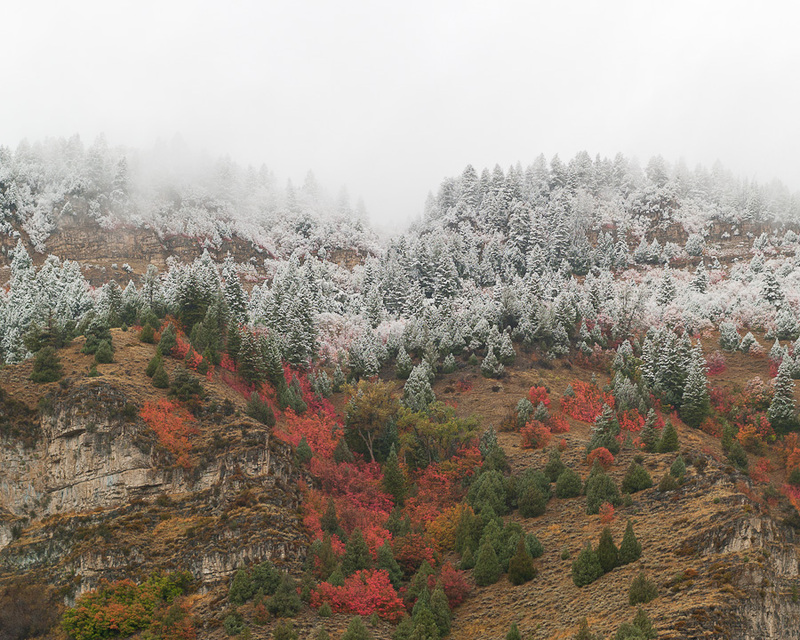 We had seen plenty of gorgeous fall color and snow caped cliffs, had a nice drive and we not looking to do any camping do to getting stuck. Back at the junction of Herd Hollow Rd. I had a decision to make. Either head back on the Left Hand Fork which I knew was solid or take Herd Hollow and end up in Logan Canyon. So the plan was to take Herd Hollow as far as we could and if passible end up at some nice locations to get shots of the snow and fall color. A short distance up the road and past the first cattle gate I came up to another truck. That’s good news. Some one else on the road should we get stuck and track to gage the road condition. Now I’m new to 4 wheeling and this was going to be the first time I heard the slipping indicator in the Xterra. The first sticky spot was just a dozen yards long so it was a bit of a warning of how the Xterra would handle these sections of the road. When on sold ground I stopped to take a few shots of the landscape and the road and pressed on. By the time we made it to the junction of roads to Logan Peak and Old Ephram’s we had driven a few more of these really slick sections. Not quite white knuckle but definitely not a casual drive. Having the tracks of the truck in front of me as a guide of where to go and where not to go was helpful on this first trip through the mud. I kept the truck moving a good speed so not to sink or loose grip but just fast enough to keep it under control. I wanted to make it though wile doing minimal damage to the road. I’m not a fan of people that just blast through these areas just to get the truck muddy and mess up the road. I also did not want to drive off the road surface and make the road wider than necessary. 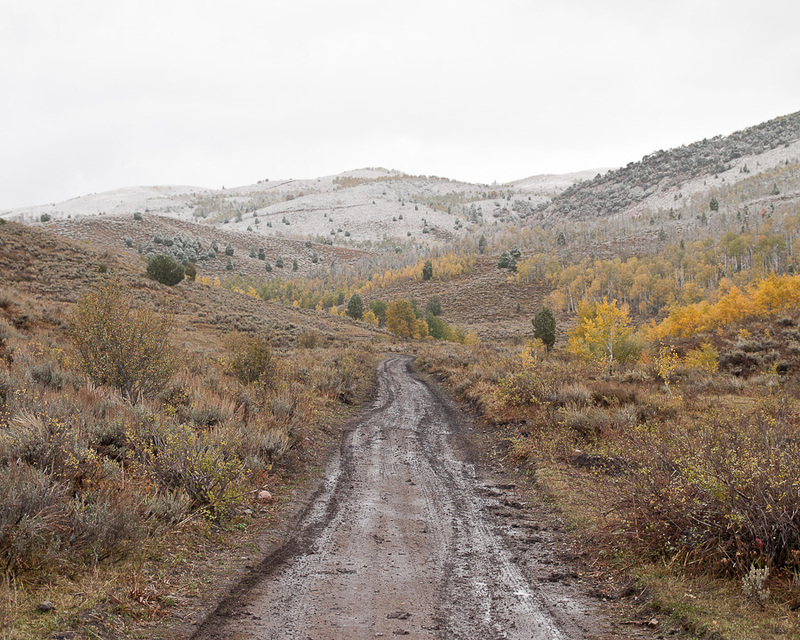 The road down from the junction to Logan Canyon was well maintained and uneventful. A nice change and appreciated. From there we headed toward Tony Grove taking plenty of stops along the way to photograph the landscape covered with a thin layer of snow. Though this subject matter has been done before by many photographers it is such a nice visual that I just give in and go for it. 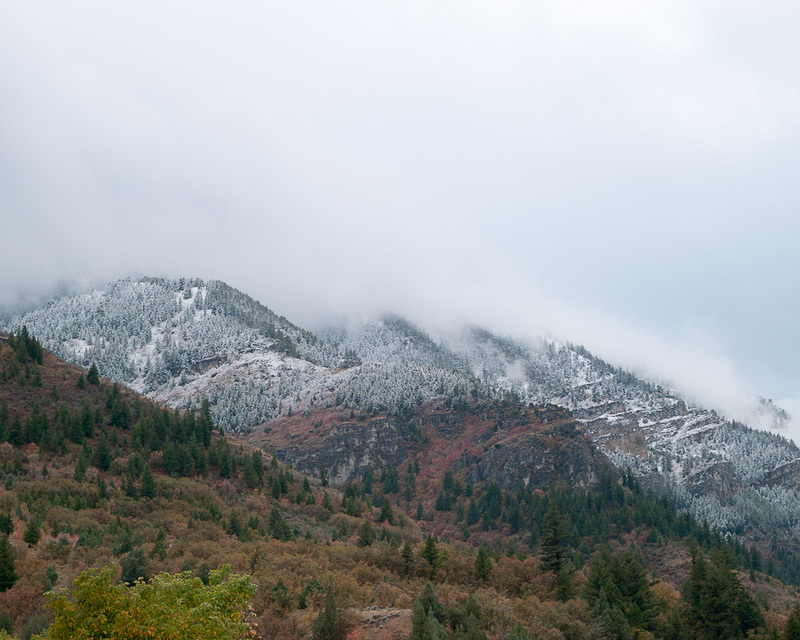 Overall this first snowfall and our journey to look at it was a success. New places, experiences, appreciations and few good images along the way to remind and inspire more exploration of Northern Utah this winter.